Allwinner H6 is a quad core Cortex A53 processor designed for 4K HDR set-top boxes and TV boxes that also comes with high speed interfaces like USB 3.0 and PCIe. 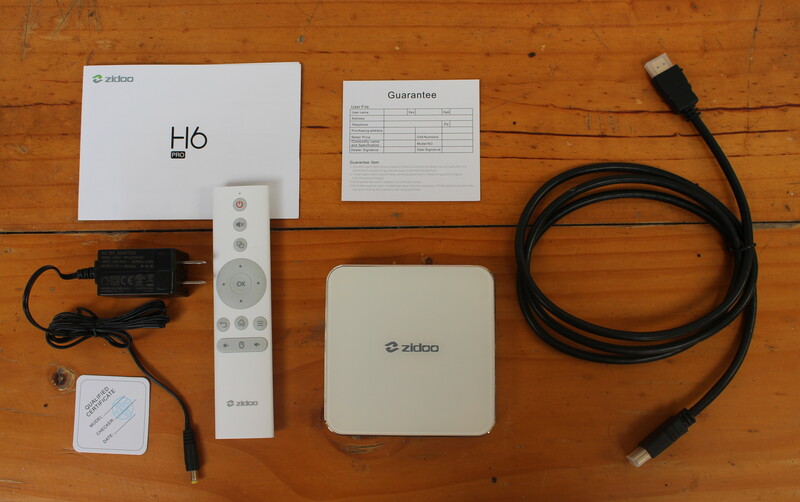 While at least one other company is working on an Allwinner H6 development board, Zidoo is the only company that I can find whose made a TV box based on the processor: Zidoo H6 Pro. They’ve just send me a sample from their local supplier for review, and as usual, I’ll start by checking out the hardware inside out, before testing the firmware and multimedia capabilities in the second part of the review in a few weeks. The box ships with a HDMI cable, a 5V/2A power supply, a Bluetooth + Infrared remote control taking two AAA batteries, a user guide in English, a guarantee card, and a “qualified certificate”. The main body of the case is made of metal, but the top is glass. We’ll find a window on the front panel that looks to be for an LCD display, but as we’ll see below it’s only for an IR receiver, and a small hole is used for the power LED. The two sides includes two USB 2.0 ports, including one OTG port, one USB 3.0 port, and a micro SD card slot. The rear panel features an AV (composite + stereo audio) jack, an HDMI 2.0a port, Gigabit Ethernet, optical S/PDIF, and the power jack. 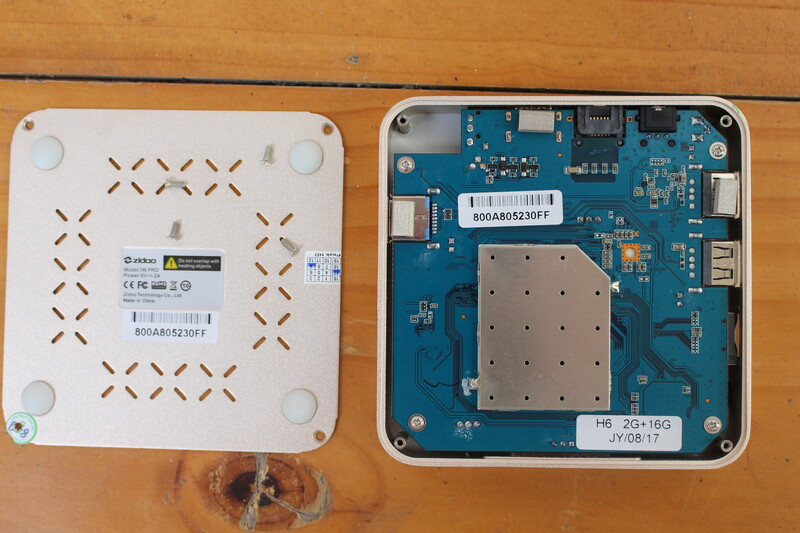 We can peak inside the device after loosening four screws on the bottom of the case. Not much to see here, except a metal shield placed on the bottom side of the processor and RAM chips. A sticker makes sure I got a board with 2GB RAM, and 16GB flash. I wonder what the orange rectangle with a hole in the middle is for. Any idea? If we take out for more screws we can completely remove the board from the case. We’ll find the WiFi antenna attached to a sticky surface (if you look closely, an ant also got captured, not sure a Chinese or Thai ant though :)), and cooling is achieving with a small heatsink placed on top of Allwinner H6 SoC. Two 8Gb (512MB x 16) SKHynix H5AN8G6NAFR-UHC DDR4-2400 brings us 2GB RAM, while a 16GB Samsung KLMAG2GEND-B031 eMMC 5.0 flash is used for storage. Its theoretical performance is: 230/50 MB/s for sequential R/W, and 6.5K/6K R/W IOPS, which should allow for a responsive system, free of “app not responding” issues. Ampak AP6255 module enables 802.11 b/g/n/ac WiFi and Bluetooth 4.2, while Realtek RTL8211E transceiver and SG24002 transformer are used for Gigabit Ethernet. 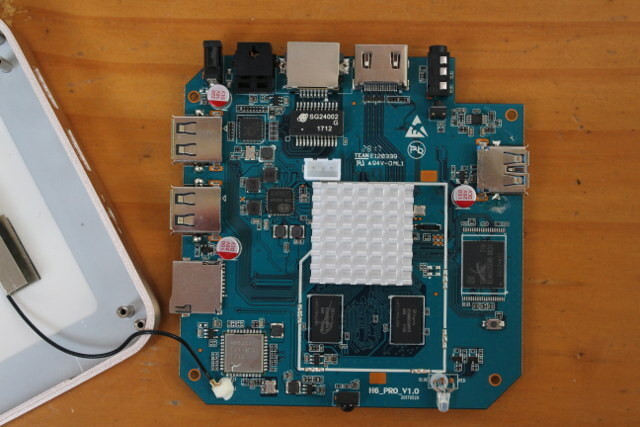 X-Powers AXP805 should be Allwinner H6 companion chip to handle power management. 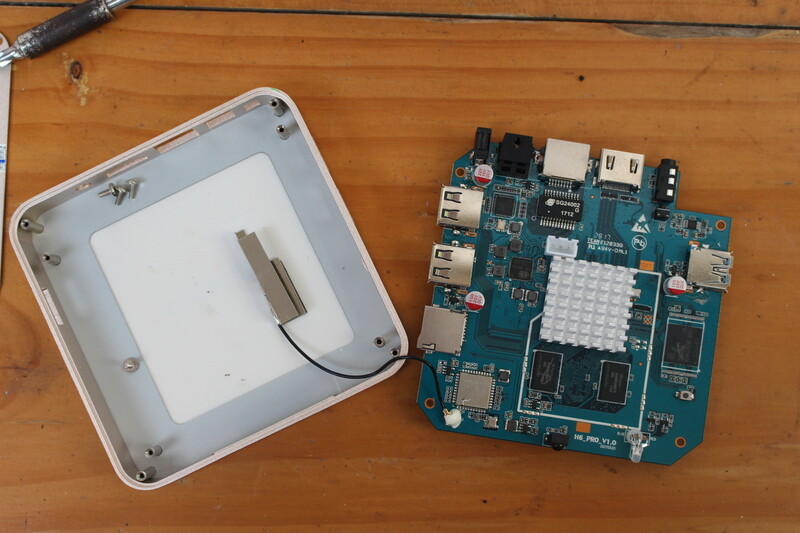 Other potentially details include the recovery button hidden behind the AV port, and the 3-pin connector close to the processor should be the serial console. I normally leave the remote control alone in my reviews. But since Zidoo decided to include a Bluetooth remote, it went through the “operation table” too. 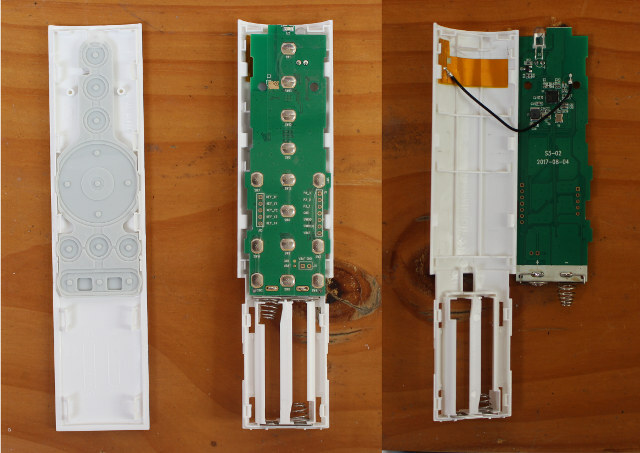 We can see both the IR transmitter, and the Bluetooth antenna inside the remote control. 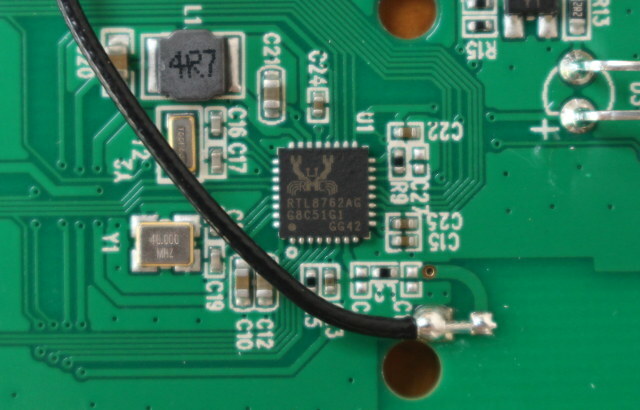 The brain of the input device is Realtek RTL8762AG Bluetooth 4.2 Low Energy chip, part of RTL8762A family, based on an ARM Cortex-M0 MCU with 256KB eFlash, and 80KB RAM. I’d like to thank Zidoo for sending a review sample. Distributors and resellers may inquire the company via the product page, and individuals can purchase the TV box for around $90 on various websites including GearBest, GeekBuying, ChinaVasion, Banggood, and others. 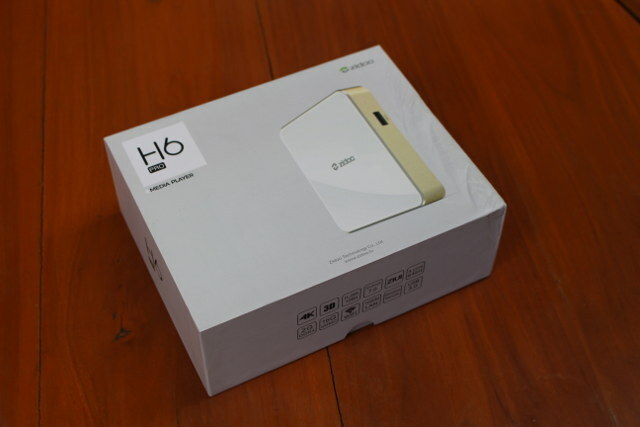 Continue reading Zidoo H6 Pro (Allwinner H6) TV Box Review – Part 2: Android 7.0 Firmware. The orange hole with all the vias around it looks like a thermal passthrough for the wireless chip. It’s right under it, right? It’s right under the PMIC (AXP805). So it’s made for cooling the chip? It must have a very limited effect, no? Well, the usual cut and paste different facts in adverts, look like will plague these boxes. Geekbuying has an advert where one minute they say it is has 2GB DDR3 memory and next the graphic says 2GB DDR4. I too for no genuine factual reason worry about heat problems. Not really, many of these chips come with a metal pad in the center of the bottom which the die itself is mounted on and it’s meant for heatsinking the chip. So, an array of vias–even that really large via–under them are common. They provide a low thermal impedence path to the ground plane. This looks to be a four layer board (or more) and those vias will be contacting the internal ground plane. From the picture they’re also contacting a pour on the bottom which the RF shield seems to be soldered to. That’s going to let it use the RF shield as a heatsink to some extent–that’s not the best linkage. Also, that big via should be full of solder. Looks like they didn’t stuff enough paste in the hole before reflowing the board. Hello, Awaiting your Part 2 of the review with impatience (I like your indepth reviews). I’m hesitating between this box and the Tanix TX92/Vorke Z6. Which one would you recommend between those two? Zidoo X6 review will be posted around November 6th. No opinion yet, since I’ve not started the box. 802.11ac WiFi performance will be reported (I’m about to test it right now), but no Netflix HD since I don’t have an account. But I can tell you that Widewine L1 DRM is enabled in the box, so that’s part of it. But I’ll take your comment about Widewine L1 like a probable yes 🙂 But, what about the Netflix certification? This device got it? I have Minix and since they don’t have such cert, Netflix is always SD, it never comes even to 720. Thanks in advance for your guidance. If it supports Netflix HD, it’s probably 720p only, and using the same trick as MINIX NEO U9-H -> https://www.cnx-software.com/2016/11/28/how-to-play-netflix-hd-on-any-android-device-with-widevine-level-1-drm/ (reading comments there might help too). Zidoo is not there, so it’s not officially supported. Hello CNX! thanks for your response. Netflix just have told me there is not a tv boxes list available yet, but they will soon, ha. I wanted to check anyway, that’s because now Zidoo is advertising the H6 Pro with 1080 Netflix feature (Geekbuying), are they out of their mind? I am confused. I really hate Android TV and its apps, I’d love to get a regular Android’s TV Box with at least FHD Netflix, Wetek is not an option because I think it’s expensive and outdated. :/ ..
CNX, Hear mee… can ı install u-boot over the serial? and can ı insyall mainline kernel to this box? by the way , sorr for my bad english. There may be a way, but not sure how. Since there’s no hobbyist RTD1295 development board, documentation is really limited. Banana Pi is soon coming with an RTD1296 board, but as we all know documentation will be poor.